A major fire broke out today at the roof of Paris’s historic Notre-Dame Cathedral. The fire led to the collapse of the spore and ravaged the roof of the gothic monument, according to Paris deputy mayor Emmanuel Gregoire. He described the incident as “colossal damage”. Workers have scrambled “to save all the artworks that can be saved,” French President Emmanuel Macron is also said to be on his way to the scene. Notre Dame Fire: US President Donald Trump on Monday called the blaze engulfing Notre-Dame cathedral in Paris “horrible” and suggested the deployment of flying water tankers. 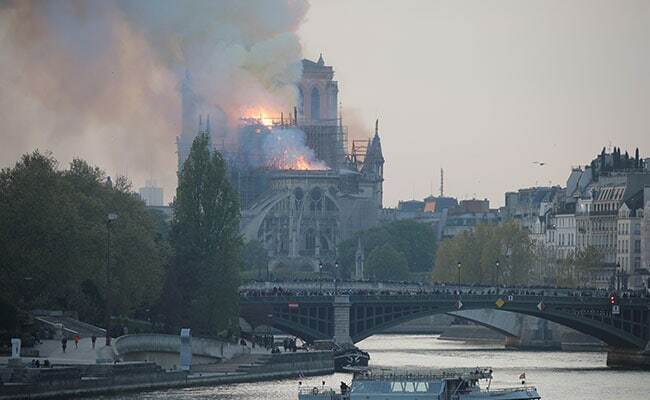 The main structure of Notre-Dame cathedral in central Paris has been saved after hours of fire-fighting to put out a devastating blaze, the city’s top fire official said late Monday, reported news agency AFP. 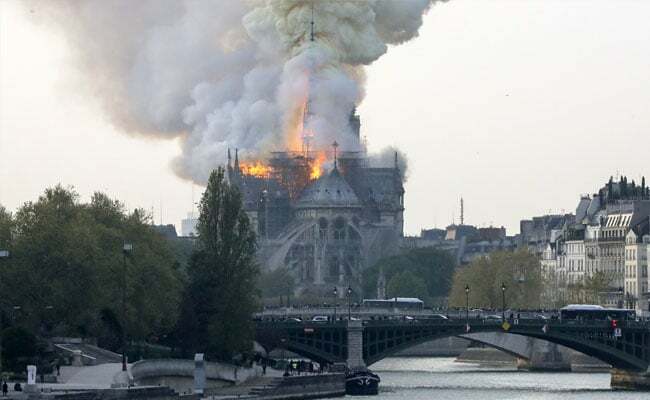 “We can consider that the main structure of Notre-Dame has been saved and preserved,” Paris fire brigade chief Jean-Claude Gallet told reporters outside the cathedral, adding it appeared that the two main towers of the building had now been saved. Around 400 firefighters were attempting to stop the destruction of the Notre-Dame cathedral in Paris on Monday evening, describing the blaze as “difficult” to handle, reported news agency AFP. “We are not sure we can stop the spread to the northern tower,” junior Interior Minister Laurent Nunez warned reporters, referring to the two stone towers at the front of the Gothic masterpiece. US President Donald Trump on Monday called the blaze engulfing Notre-Dame cathedral in Paris “horrible” and suggested the deployment of flying water tankers, reported AFP. “So horrible to watch the massive fire at Notre Dame Cathedral in Paris. Perhaps flying water tankers could be used to put it out. Must act quickly!” Trump tweeted. The cause of the blaze was not immediately confirmed, but the cathedral had been undergoing intense restoration work. The Paris fire service is not sure it will be able to halt the spread of the fire consuming the roof of Notre-Dame cathedral, a senior fire official at the scene told journalists on Monday night, news agency AFP reported. “It’s not certain we’ll be able to halt the spread toward the northern bell tower. If that collapses, you can imagine the extent of the damage,” General Jean-Claude Gallet said, adding that 400 firefighters were battling the blaze. The Catholic Church in the Holy Land said it is praying the fire that ripped through the Notre-Dame cathedral in Paris on Monday was “not intentional” while expressing solidarity with the church in France, news agency AFP reported. “We pray that there will be no injuries, for the fire not to be intentional and for least possible damage to the Church,” a statement released in Jerusalem said. “We express our solidarity with (the) Church in France,” the statement added. It came as France’s deputy interior minister said that saving the Notre-Dame “is not certain” and as French fire services said they are “not sure” that the blaze could be stopped, reported AFP. 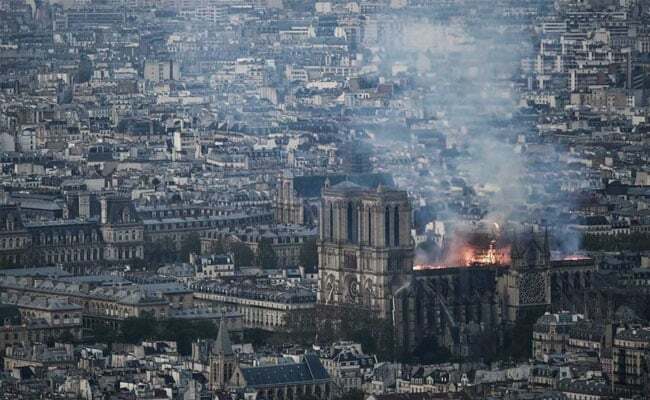 Germany lamented the huge fire devastating Notre-Dame Cathedral in Paris on Monday, with Chancellor Angela Merkel’s office calling the building a “symbol of France and of our European culture”, reported news agency AFP. “These horrible images of Notre-Dame on fire are painful,” Merkel’s spokesman Steffen Seibert said on Twitter. The spire of Notre Dame Cathedral collapsed on Monday as a massive fire spread through the iconic building. London “stands in sorrow” with Paris over the devastating Notre-Dame Cathedral fire, the British capital”s Mayor Sadiq Khan said Monday, reported news agency AFP.